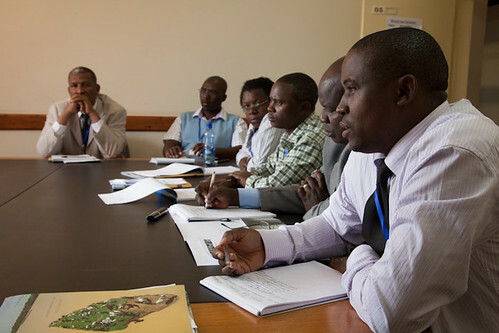 Animal health experts from Kenya discuss future priorities for brucellosis control. They were part of a group of 60 participants at an international workshop held to discuss an integrated approach to controlling brucellosis in Africa. The workshop took place at the ILRI Addis Ababa campus 29–31 Jan 2013 (photo credit: ILRI/Zerihun Sewunet). ‘Thousands of Kenyans are being wrongly diagnosed and treated for the milk linked disease brucellosis, reveals a new study. Now researchers at the Kenya Medical Research Institute (Kemri) and six international institutions, want the responsible test withdrawn from public hospitals. For example, in 2012 some 75,256 cases of brucellosis were reported to the Kenya Health Information System, but going by the new study only about one per cent of these patients may have been infected. ‘“. . . The diagnosis for brucellosis has been a challenge and it is time we looked into it seriously,” said study supervisor Prof Sam Kariuki of Kemri. Prof Kariuki said such an off mark diagnostic tool has serious cost and health implications to patients. . . .
‘The test, called febrile antigen brucella agglutination test or FBAT is used in Government facilities throughout Kenya. “It appears to have very poor diagnostic specificity and should be phased out,” the study recommends. ‘The study published on Friday in the journal PLOS Neglected Tropical Diseases also involved the Nairobi-based International Livestock Research Institute and several research institutions from Germany, UK, Spain and Sweden. ‘The researchers tested 825 patients for brucellosis at the Busia County Referral Hospital and at Kemri’s Alupe clinic in the same area. The team used the regular government test FBAT, a second one called Rose Bengal Test (RBT), while another two kits were used to confirm the results. Read the whole article by Gatoyne Gathura at Standard Digital (Kenya): Thousands of Kenyans wrongly diagnosed, treated for brucellosis, 11 Apr 2017. Eric Fèvre, a veterinary epidemiologist on joint appointment at ILRI and the University of Liverpool, gives an overview of the livestock and human health projects he leads at ILRI (photo credit: ILRI/Susan MacMillan). The researchers provide the following useful statements in their paper’s abstract and summary. ‘Brucellosis is a debilitating disease of people caused by infection with one of a number of different Brucella species. In almost all cases, people acquire the infection through exposure to infected animals or contaminated animal products. ‘Human brucellosis is well known for its wide range of symptoms, and is often clinically indistinguishable from other infectious diseases, such as malaria or typhoid. Diagnosing the disease therefore typically relies on laboratory tests. A wide range of tests are available, but little is known about the accuracy of the principal test used in Government health facilities in Kenya, the febrile Brucella agglutination test (FBAT). ‘In this study, we identified people with symptoms compatible with brucellosis attending health centres in Kenya. By comparing results from the FBAT performed on samples collected from these individuals with the results from a range of well-established diagnostic tests, we were able to show that the FBAT produces large numbers of false positive results. ‘The findings from this study strongly suggest that human brucellosis is being over-diagnosed in a mixed farming area of western Kenya. We expect that this is contributing to the over use of antibiotics, and has important economic impacts on affected patients. Read the whole research paper in PLOS Neglected Tropical Diseases: Poor performance of the rapid test for human brucellosis in health facilities in Kenya, by William A de Glanville (University of Edinburgh and ILRI), R Conde-Álvarez, I Moriyón, J Njeru, R Díaz, Elizabeth AJ Cook (ILRI and University of Edinburgh), M Morin, BM de Bronsvoort, Lian F Thomas (University of Edinburgh and ILRI), S Kariuki and Eric Fèvre (ILRI and University of Liverpool), 7 Apr 2017. 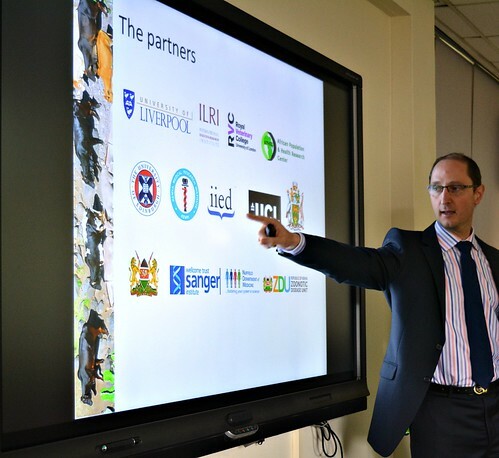 Tags: Busia, Eric Fevre, KEMRI, PLOS Neglected Tropical Diseases, Standard (Kenya), University of Edinburgh, University of Liverpool. Bookmark the permalink.